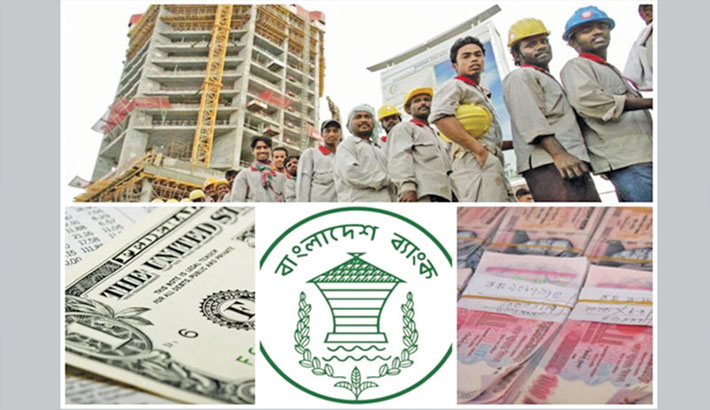 After two years of slowdown, Bangladesh’s inward remittance posted an upward trend in last four months with most of the expatriates sending home their hard-earned money through formal channels, according to Bangladesh Bank. Inward remittance inflow hit $1.33 billion in April this year, posting a 21.46 percent year-on-year growth over last April’s inflow of $1.09 billion, according to central bank data. Remittance inflow in last 10 months (July-April) of the current fiscal increased by 17.5 percent or $1.8 billion to $12.09 billion from $10.29 billion during the same period last year. Of the total remittance inflow in April, private commercial banks channelled $975.57 million in inward remittance while the state-run commercial banks handled $326.56 million, foreign commercial banks $14.12 million, and specialised banks facilitated the transfer of $10.93 million. Islami Bank Bangladesh channeled the highest $266.19 million. Agrani Bank managed the highest $130.35 million among the state-run banks. BB officials said remittance inflow usually increases ahead of Ramadan, which is followed by Eid-ul-Fitr, one of the biggest religious festivals for the Muslims. Analysts observed that appreciation of US dollar against local currency taka has been a major factor behind the rise in remittance inflow. “Expatriates are now using the banking channel to send money to their families in Bangladesh. However, the banks should continue their efforts so that the expatriates use the formal channels to send remittance,” Former BB Governor Salehuddin Ahmed said while talking to the daily sun. The exchange rate of US dollar, which was Tk 78.7 in January 2017, soared to Tk 80.6 in June 2017, Tk 82.9 in January 2018 and Tk 86.98 at the end of April this year. Bankers said a higher exchange rate for the US dollar works as an incentive for the expatriates to send money through the legal channels. Agrani Bank Chairman Zaid Bakht said different initiatives taken by Bangladesh Bank are inspiring expatriates to send money through legal channels. “There are two key factors behind the rise in remittance inflow—— regulatory actions against illegal channels like Hundi and recent appreciation of the dollar against taka,” Zaid Bakht told the daily sun on Friday. BB introduced awards in 2014 to recognise the remitters for their contribution to the economy and encourage expatriates to send more money through formal banking channels. “Bangladesh Bank has taken a number of measures to check the use of illegal channels including digital hundi, which also worked as a catalyst behind the increase in inward remittance flow,” Zaid added.